It is fairly simple to equip the Yupiteru MVT5000 with a discriminator output. 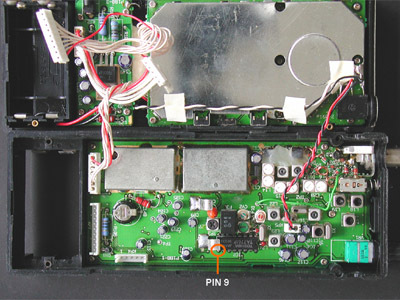 The FM receiver IC is a TA7761, with the baseband audio on pin 9. After opening the scanner, you can disconnect two sockets, as shown on the picture below. This makes the two scanner halves easier to handle. A 10 k resistor is connected to pin 9 of the receiver IC. 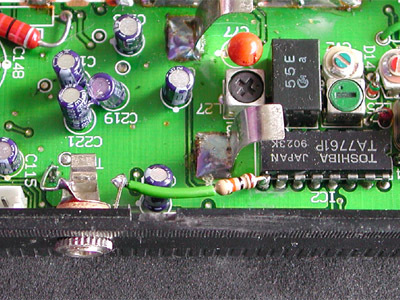 The resistor's other lead is connected to the centre connector of a 3.5 mm mono chassis socket that can be mounted in the scanner's side panel. The socket's ground lug can be connected to the cicuit board's ground area. You will have to remove some of the protective lacquer, e.g. by using a screwdriver or scraping tool.